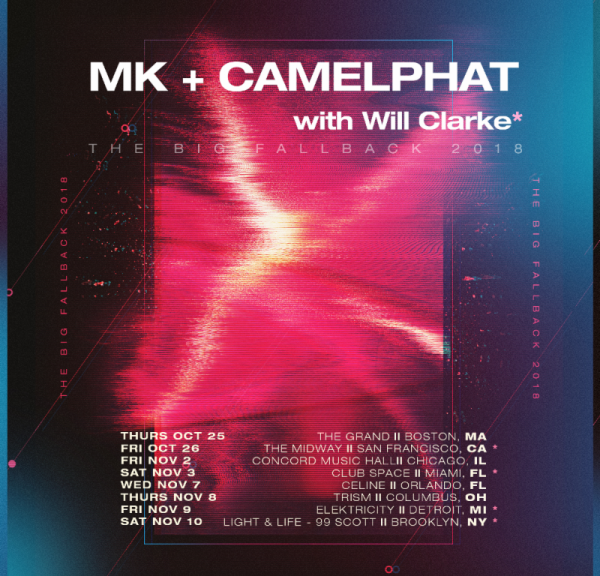 MK and Camelphat announced last Tuesday their United States “The Big Fallback Tour 2018,” with special guest Will Clarke on select dates. MK, aka Marc Kinchen, who is well-known for his hot track “17,” has been touring most of this year, headlining festivals like Holy Ship and Phoenix Lights, and is currently scheduled for Ibiza and the UK before he makes his way back to the states for this tour. Camelphat, who has gained most of their fame due to their hit track “Cola,” that features Elderbrook, has also been on the move, with one of the most well-renowned festivals they’re playing being Defected Croatia just last week. Will Clarke, who is also one who can bring a slower tempo, only adds another level of talent to the tour. This is a tour no one will want to miss.